It’s not that hard to live a simple life, you just need to be determined about it. If you are able to keep a few tips in mind, simplifying your life will be more achievable. Jumia Travel, the leading online travel agency, shares five smart tips to help simplify your life. Too much physical and mental clutter isn’t good, and it is necessary to declutter and get things more organized. This can help to not only simplify your life, but help you feel more in control of your life. So, if there are things in or around your house that you don’t need or that have no positive use or function in your house, you should throw it out. Also ensure items and important documents in your house are well arranged and easily accessible, so you don't have to scatter the house looking for them, especially when going out or traveling. To simplify your life, you need to learn to be decisive. Don’t invest some much time and energy in unhealthy relationships. You need to identify these unhealthy relationships that dampen your spirit, and decide to either figure out how to make them work, or put an end to them. Give it as much thought as you want, but don’t lose sight of the fact that you need to be decisive about it. As much as relationships can be complex and confusing, try as much as you can to understand emotions and aim for simplicity in your relationships. Alone time is crucial for us, human beings because it gives us an opportunity to get to know ourselves, and helps with self-discovery. Until you have an understanding of who you are and your kind of person, simplifying your life will really only remain an aspiration. 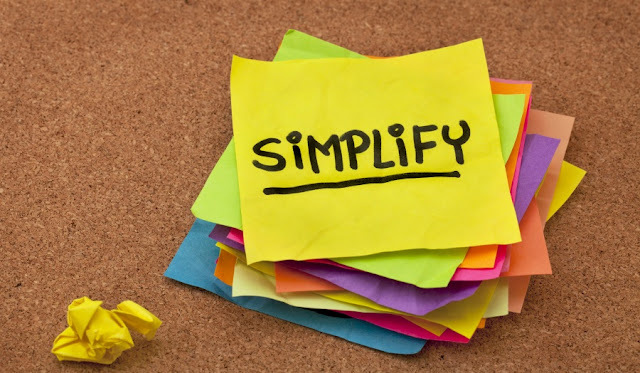 This is because you can't really simplify what you don’t understand, and if you don’t understand yourself, simplifying your life will be difficult. It amazing how much Facebook, Twitter and Instagram posts and notifications can drag down and complicate a person’s life. Try to make face-to-face interactions a priority, and keep in touch with the people in your life through phone calls or hangouts, rather than stalking their social media profiles. You'll thank yourself later for it when you see the results. Also, when traveling consider going to travel forums and blogs to get needed information from travel experts or enthusiasts, rather than depending on social media for all your information. Don’t live above your means, no matter how tempting it might be. Always remember that it is best to live within your means and be able to sleep well at night, than to live above your means and sleep with an eye open because of acquired ‘gbese’. Also, it is best to learn to live within a budget, so you don't end up being stranded financial at very uncomfortable times. Even when you go out with friends or when you're on vacation, it is vital that you have a budget to guide your spending and stick to it.